Classic Bollywood poster of the hit Hindi film, Hum Dil De Chuke Sanam (1999) for sale. 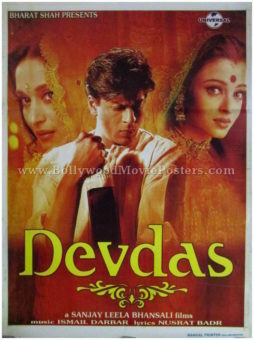 This is an actual surviving classic Bollywood movie poster of the 1999 film that featured superstar Salman Khan in the lead role opposite beauty queen, ex-Miss World, Aishwarya Rai. Printed and circulated during the initial first release of the film, this classic Bollywood poster was designed for publicity of the film but never ended up being used. 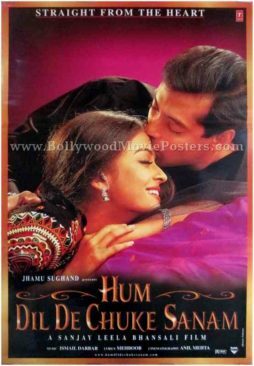 This Hum Dil De Chuke Sanam poster is printed with a glossy finish on thick stock paper, and features a stunning image of Salman Khan kissing Aishwarya Rai on her forehead. 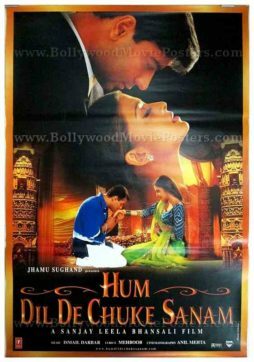 The typography used in this Hum Dil De Chuke Sanam poster is entirely in English and it is set against a stunning purple background. Hum Dil De Chuke Sanam is a 1999 hit Hindi film starring superstar Salman Khan in the lead role opposite beauty queen, ex-Miss World, Aishwarya Rai. Directed by Sanjay Leela Bhansali, the film was released outside India as “Straight from the Heart.” Ajay Devgan also stars in this love triangle. The film’s spectacular music, composed by Ismail Darbar, bagged several awards. Chart toppers like “Aankhon Ki Gustakhiyan”, “Chand Chupa Badal Mein”, “Dholi Taro Dhol Baaje”, “Hum Dil De Chuke Sanam” & “Nimbooda” are played till today. 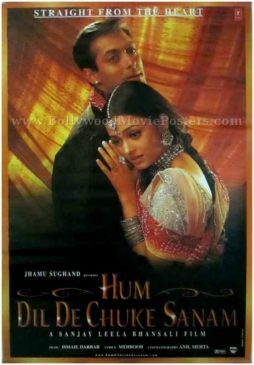 Classic Hindi movie poster of the hit Bollywood film, Hum Dil De Chuke Sanam (1999) for sale. Printed and circulated during the original first release of the film, this classic Bollywood poster was originally designed for publicity of the film but never ended up being used. This classic Bollywood film poster is printed with a glossy finish on thick stock paper, and features a stunning image of Salman Khan & Aishwarya Rai locked in a passionate embrace. The typography used in this classic Hindi movie poster is entirely in English. Hum Dil De Chuke Sanam is a 1999 hit Hindi film starring superstar Salman Khan in the lead role opposite beauty queen, ex-Miss World, Aishwarya Rai. Directed by Sanjay Leela Bhansali, the film was released outside India as “Straight from the Heart”. Ajay Devgan also stars in this love triangle. 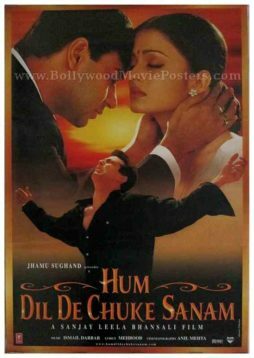 Classic Bollywood film poster of the hit Hindi movie, Hum Dil De Chuke Sanam (1999) for sale. This is an actual surviving Bollywood poster of the 1999 film that featured superstar Salman Khan in the lead role opposite beauty queen, ex-Miss World, Aishwarya Rai. Printed and circulated during the original first release of the film, this classic Bollywood movie poster was originally designed for publicity of the film but never ended up being used. This classic Bollywood film poster is printed with a glossy finish on thick stock paper, and features the lead actors in the love triangle – Salman Khan, Ajay Devgan & Aishwarya Rai. The typography used in this classic Hindi movie poster is entirely in English. Classic Bollywood movie poster of the hit Hindi film, Hum Dil De Chuke Sanam (1999) for sale. This is an actual surviving poster of the 1999 film that featured superstar Salman Khan in the lead role opposite beauty queen, ex-Miss World, Aishwarya Rai. Printed and circulated during the first release of the film, this classic Bollywood movie poster was originally designed for publicity of the film but never ended up being used. This poster is printed with a somewhat glossy finish, and features the lead actors in the love triangle – Salman Khan, Ajay Devgan & Aishwarya Rai. The typography used in this poster is entirely in English.